The Abu Dhabi emirate is the largest in the UAE and much is happening here to draw visitors to this fast-developing wonderland that respects the past and looks forward to an entertaining and amazing future. The comfortable Etihad Airways flight lands at the Abu Dhabi International Airport and throws me immediately into a world of romantic modernism. I learn that until a relatively short time ago, the Abu Dhabi emirate was little more than a beautiful desert dotted by nomadic settlements and tribes. Today, the area beckons with its Vision 2020 that envisages the creation of amazing infrastructure built virtually from scratch: museums, residences and hotels. The economy, formerly based on pearl diving, fishing and date palm cultivation, is today looking at tourism after the oil discovery of 1958 brought about radical changes in the area. Meaning ‘Father of the Gazelle’ in Arabic, Abu Dhabi was founded when a young antelope led a wandering tribe to fresh water, on an island with no more than 300 palm huts or barsatis and the ruler’s fort. This simple settlement is today an area that strongly protects and promotes its past, along with its fast-changing future. Within a few hours of arriving here, I am comfortable with a thimble-cup shot of Arabic coffee, strong to the dregs, coupled with a date stuffed with orange peel that complements it perfectly. I am not sitting in a nomadic hut, however, while indulging in this traditional hospitality but in a hotel that could put any Sultan’s palace to shame. Featuring over 400 natural islands and more than 400 kilometres of pristine coastline, the Abu Dhabi emirate today offers modern cityscapes, tranquil oases, UNESCO World Heritage Sites, treks into the desert, parks and amusements, stretching golf courses, amongst other attractions. Here below, a few reasons to visit the UAE’s capital, Abu Dhabi city, and a couple of exciting excursions close by…. This iconic hotel has been well named for it offers all the hospitality and luxury of a royal abode, blending Arabian splendour with the latest technology. Straight out of an Arabian Nights fantasy, it boasts lush gardens, water fountains, a magnificent central dome (one of 114 smaller ones) and interiors embellished with gold, mother-of-pearl and crystals as well as impressive handmade wall display carpets. Situated as it is just minutes from the Corniche, the city’s manicured waterfront that includes play areas, cycle and pedestrian pathways, cafes, restaurants and the Family Park, you cannot get more central than this. We enjoy an extensive lunch buffet at Le Vendome, one of the many restaurants. And later, on the night before we leave, we are treated to a delightful dinner table laid out in formal splendour right on the beach, while an array of kababs and other delicacies are served to us. This of course is beyond five-star luxury, I think, as I wiggle my toes in the cool sand. Like a mirage out of the heavy heat haze, rises up the Sheikh Zayed Grand Mosque, an architectural work of art and one of the world’s largest mosques with a capacity for 41,000 worshippers. The mosque’s first ceremony was the funeral of its namesake, His Highness Sheikh Zayed Bin Sultan Al Nahyan, who is buried at this site and did not get to see the completion of his monument, which in fact, we are told, remains a work in progress. The structure features 82 domes (they appear to be lace-clad from the inside), 1000 columns, 24-carat gold plated chandeliers and the world’s largest hand knotted carpet, created partly in Iran. The Garden Room which we enter first, has flowers, vines and leaves creeping in the colours of natural marble along the floor and onto the walls. The large hall, cooled and amazingly comfortable on this hot day, has marble pillars inlaid with mother-of-pearl and shell made in China, enormous chandeliers covered with Swarovski made in Germany and that huge carpet; a variety of crafts and cultures are ably represented besides local artisanal skills. A visit to this facility introduces us to ‘DNA 4 Life’, a cardiovascular risk reduction package and personalised lifestyle medicine programme that represents an integrative approach to the treatment of chronic disease and healthy aging, introducing a new shift in the way medicine is being practiced worldwide. A new era of personalised healthcare offers a unique model of integrative lifestyle medicine, complemented by centuries-old healing traditions for optimal mind-body-spirit balance. The centre also boasts a portfolio of non-invasive bio-aesthetic therapies, anti-aging treatments and signature beauty products, designed by Hollywood’s bio-aesthetician to the stars, Jamie Sherrill. Procedures to make you look optimal for that red carpet event! About 500 metres off the coast of Abu Dhabi city, the 27-square-kilometre Saadiyat Island is set to be transformed into a world-class leisure, residential and cultural hub. The Manarat Al Saadiyat, the island’s purpose built visitor centre, brings this vision to life. This will include the Louvre Abu Dhabi opening in 2016, the Guggenheim Abu Dhabi opening 2017 and the Zayed National Museum opening in 2016. Models show these to be designed by Pritzer Prize winners, ground breaking constructions that will indeed attract attention in the world of architecture. The Saadiyat Beach Golf Club is worth mentioning here as the region’s first ocean course designed by Gary Player and respectfully embracing the natural beauty of the island. We have dinner here in an atmosphere of casual chatter and informal abundance. This I would dub a ‘must visit’! The award-winning specialist hospital (and conference centre) is the most advanced of its kind in the world and guided tours are available. Falcons are the national emblem of the United Arab Emirates. Dating back centuries, falconry is a sport that connects with the past where Arab beduins would capture falcons to hunt for their food. We witness a ‘Falcon manicure’ where the bird’s talons are clipped, cleaned and buffed (because they could hurt themselves). Falcons, we learn, become family members and live with the families that own them and have a very special relationship with the falconer. Sheikh Zayed was a very keen falconer and knew each of his falcons by name, informs hospital director Margit Gabriele Muller who has been awarded several awards for this project. An image in the hospital’s museum of the Sheikh sitting around a fire trading falcon stories with other falconers in the forest reveals the democratic spirit of this sport. I am charged with energy and excitement as I don a leather glove and a falcon, a beauty with black and white feathers, is handed to me. Later, she is fed (on a leather glove as well) much to her delight. That evening we head down to the marina for a nautical thrill-adventure by Yellow Boats. Abu Dhabi city, we discover has a stunning skyline vista from the water, as we make our way on the waves on one of Yellow Boats’ top-of-the-line inflatable craft powered by the latest generation of eco-friendly engines. Daniel is our skipper and claims to have Indian blood though he hails from Mauritius. We hug the coast, along the Corniche, view the stupendous Presidential Palace that is under construction on its own little island, pass by the fishermen’s village where the traditional dhows are at anchor, piled high with fishing cages and forming a poetic contrast against the high rises in the background. The sun is strong but the sea breeze is cool, making it all very pleasant. A short drive from Abu Dhabi city takes us to Yas Island, home to some of the area’s most exciting attractions, racing events, concerts and other entertainment, including home to the annual Formula 1 Etihad Airways Abu Dhabi Grand Prix. A visit to the Yas Marina Circuit, one of the most innovative Formula One tracks in the world and a state-of-the art motorsport destination, allows you to choose from a racing experience at the Yas Racing School, the Yas Kartzone and the Yas Drag Racing Centre. 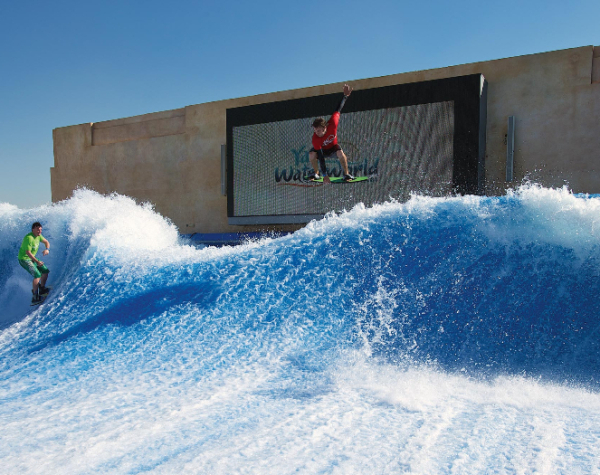 Having finished this, we visit the nearby Yas Waterworld, the UAE’s first waterpark, which offers 43 thrilling rides, slides and attractions with a unique theme based on an original story developed exclusively for the water park that pays tribute to the UAE’s pearl diving heritage. Yas Island also features Ferrari World Abu Dhabi, the world’s first Ferrari theme park and largest indoor theme park. In an amazingly constructed structure, we familiarise ourselves with the Ferrari story through more than 20 rides and educational attractions. We stand amazed at the Ferraris on display and only the bravest of us boards the Formula Rossa, the world’s fastest roller coaster. Be prepared to come off it with your hair somewhat in disarray! This however can be rectified with a rather satisfying Indian dinner at Angar, on the ground floor of the Viceroy, one of the island’s premiere hotels. Population: Abu Dhabi is the largest and most populated of the seven emirates that make up the United Arab Emirates (UAE) with over 80 per cent of its landmass. The population is now over 1.6 million. Climate: A sub-tropical arid climate with sunny blue skies and high temperatures through most of the year. National dress: Men wear the white full-length kandura with white or red checkered headdress (ghutra) secured with a black cord (agal). Women wear a long loose black robe (abaya) over their normal clothes and a headscarf (sheyla). The abaya may be intricately embroidered or set with crystals and can cost as much as a designer ensemble. Local currency: The dirham (AED) is divided into 100fils. The Dirham is fixed to the US$ 1.00 = AED 3.67. Best buys: Ornate wooden carvings, local art, gold jewellery, carpets, incense kits and perfumes, dates, Lebanese sweets, camel milk chocolate.